All switch units are fairly easily installed and come with instructions, but if you are in any doubts employ a qualified electrician. The safe method of extending or repairing mains electrical cables. Plastic casing, weatherproof glands, rubber seals and terminal block. Not for under-water use. 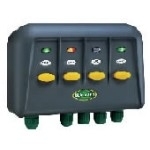 This is a 3-way switch box, allowing you to run 3 different appliances from one power supply, and is designed for safe pond-side and garden electrical connections.Single fuse. Blagdon switch box designed for safe pond-side and garden electrical connections. Individually fused outlets for 1 x 1000W and 2 x 300W appliances. With InScenio from OASE, power is available where you need it: in the garden and pond. InScenio has been developed for those who want to flood their garden with light, and want to dramatically enhance their fountains and pond technology effects – very simply. 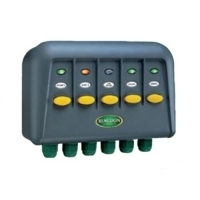 Via remote control, power circuits are turned on and off, lights are controlled or the filter capacity can be regulated. The intelligent InScenio modular system is also easy for non-specialists to install; it involves no excavation whatsoever. Even subsequent extension or complete garden and pond redesign can be easily executed with InScenio. It is not possible to use Lunaqua lighting connection with the dimmer function. Finally there is a convenient radio remote control solution for turning various devices in the garden off and on, or for reducing flow rates by dimming. OASE sets trends in garden and pond technology with InScenio garden outlets. Fitted with a stake, they can be firmly anchored in the ground. The 4 outlets and the mains input are waterproof, strain-relieved, and are suitable for year- round use. An App usable for the garden pond - at last, control your technology via WLAN! In addition, up to 10 remote-controlled OASE devices can be integrated and controlled via the app.